This Air Purifying Respirator Protection training course has been designed for those with an occupational requirement to be trained to safely undertake work activities that involve the use of respiratory protection. Every worker who may be required to wear a respirator must be trained in the proper use of the respirator to ensure the workers ability to work safely in a hazardous area. This Air Purifying Respirator Protection course will also establish an understanding of the statutory requirements of the federal COHS, Provincial and Territorial OH&S legislations. We will achieve this through discussion and by participating in skills practice and fit testing evaluation. Hazards Present & Potential Effects. 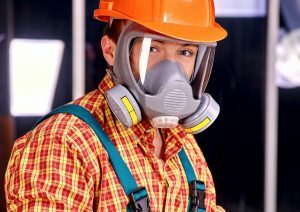 Capabilities & Limitations of Respirators. Selection Criteria, Inspection & Maintenance. Donning of the Respirator & Seal Check. Fit Testing & Medical Assessment. Proper use of the Respirator. What to do if the Respirator Fails.